The Pedco UltraPod II is a lightweight and durable tripod designed with travelling photographers in mind. The tripod is made to support larger cameras and camcorders weighing up to 6lb and is compatible with any camera featuring a tripod socket. The tripod features sturdy fold-out legs and non-slip vinyl feet to make sure that the tripod won't slip whilst taking a photograph. The Pedco UltraPod II Tripod also features a strong Velcro strap to secure your camera to tree limbs, railings, fences and other similar objects. Its unique ball-and-socket camera mount enables photography from a wide range of angles. 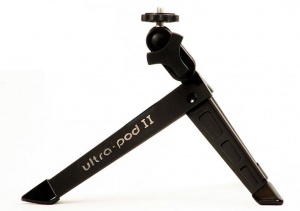 Folding to a length of just 7 inches and weighing only 119g the Pedco UltraPod II Tripod can be put into any camera bag without adding weight or bulk. It's ideal for getting those long-exposure shots or putting yourself in the frame.